In today’s world, the very idea of a 2 CD, 21 track, 96 minute Progrock concept album is likely to make even the diehard fan want to curl up in the foetal position in a corner for, say, 96 minutes. 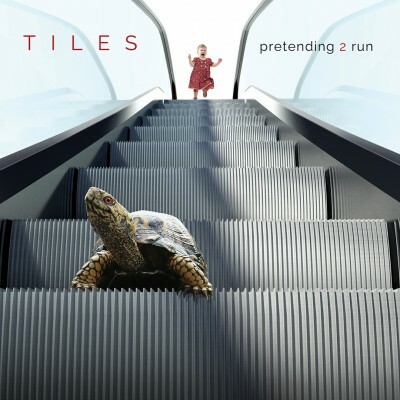 But a new release from North American rock band Tiles is not a normal circumstance. Like the band’s 2012 release, Off The Floor, it hit the streets in a blaze of little or no publicity – an unconventional, discover-it-for-yourself challenge to Progrock fans everywhere. In the years since OTF, it looked like the band had gone into one of the better witness protection programmes, but now, 4 years later, Chris Herin, Paul Rarick, Mark Evans and Jeff Whittle have reappeared with this powerful, cinematic, unselfconscious art rock album. It tracks though the life of their traumatised protagonist, a broken, betrayed soul, sifting through the fragments of his life, searching for emotional rescue, trying to cast off of more neuroses than you’d find in a Woody Allen movie. The patient, the inquisitive and the eager will discover an abundance of Progressive Rock riches here. Every track is a pocket progrock symphony – it’s produced by Terry(Rush/Klaatu) Brown and features guest appearances from a satisfyingly disparate selection of guest players whose contributions add texture and substance – Mike (Dream Theater) Portnoy’s liquid rhythms float us up and over ‘Stonewall’s densely structured defences; Guitarist Kim (Max Webster) Mitchell blazes through the mutant eastern modality of ‘Shelter In Place’ and Adam (Steven Wilson) Holzman’s charismatic synthesiser provides otherworldly soundscaping on several tracks, vividly recalling King Crimson’s layered approach to studio recording. All through disc one, lyrical and musical ideas follow each other in a succession of set piece, timeline jumpcuts, unified by a common thread. One is not dependent on the other, they connect but they are also stand alone, from the opening and title track’s feedback wail and whispering voices, through ‘Drops Of Rain’s strident rhythms, Flower Kings’ like transitions and powerpop bgv’s to ‘Small Fire Burning’s soaring vocals, courtesy of Matthew (Discipline) Parmenter. Some are initially underwhelming, but they all soon become sublimely exhilarating. Episodes in a story, compellingly and adroitly told. Ian (Tull) Anderson’s surprisingly muscular and fluid flute playing trades off beautifully against a sturdy string section on ‘Midwinter’, side two’s sombre opener. Along with ‘Friend Or Foe and ‘Battle Weary’, these opening tracks suggest our unnamed victim is getting to grips with his fraught emotional state, a notion accentuated by ‘Meditatio’s hymn like chorale arrangement, bestowing a redemptive grace on his gradual recovery. Thereafter, Herin’s incendiary axework sears through ‘The Disappearing Floor’s jerking drum and bass rhythms, and ‘P2R, Reprise 1’ and ‘Reprise 2’ sound a resounding celebration of our hero’s salvation. The album closes with the cautionary (and all too short) ‘Backsliding’, a wonderfully poetic, Beatle-esque piece, that starts out on an acoustic strum, then courses along on a bed of strings and woodwinds, peaking and then descending to a hymn like chorale arrangement, courtesy of the renowned Renaissance Choir. It is an almost religious experience. That said, if any track truly stands out on P2R, it is ‘Taken By Surprise’. The track is central to the story. Lyrically, it is a lucid moment in the protagonist’s muddled mind. Musically, it is the album in microcosm. There’s so much invention and imagination going here, so many ideas taking flight all at once that they are impossible to identify and enumerate. And at the same time we are walking between musical worlds – the lean, elegant menace of the Doors, the Hammond dominated seventies hard rock of Deep Purple, the post modern world of contemporary progressive rock, where cold, hard, sharp bursts of wiry axework percolate through pounding, percussive riffs. If there’s a criticism it’s that where you expect a climax it feels a bit, well, anticlimactic. But that’s just being stupidly picky. And perhaps it’s wrong to single out a specific track. Why? Because the whole is greater than the sum of the parts, and that, arguably, is the purpose of a concept album. Wow! Double prog rock concept albums can be somewhat daunting but I might have to give this a go!